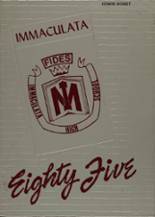 Yearbook classifieds for Immaculata yearbooks are listed below. If you want to see if others from New York, NY high schools want to make a trade for a yearbook, post your info below. You can also find out what other graduates are doing now, share memories with other alumn, upload pictures from Immaculata HS and find other alumni. I have a problem that maybe you can help with i lost my high school diploma as well and have been trying to change employment and they continue to ask me for it how can i go about getting a copy, as well as a year book. I am looking for 1979, 1980, 1981 and 1982 Yearbooks there was a fire losted all yearbooks and school ring. Moved so many times would like to have a IHS 1974 yearbook.